Boutique accommodation at Venus Bay, Victoria – venus bay holiday rentals, luxury accommodation, organics, sustainable tourism, eco friendly, solar, sustainable energy, biodiversity. Venus Bay Eco Retreat is located near a small rural hamlet approximately 180kms south east from Melbourne city on the South Gippsland coast, approximately 60kms from Wilsons Promontory National Park. Locality map. Click to enlarge. 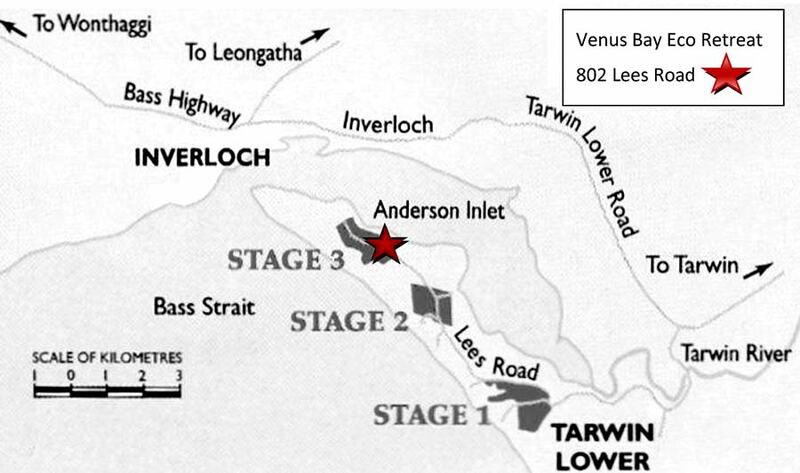 Follow maps to Tarwin Lower then to Venus Bay. Use the directions on this page to help you find Venus Bay Eco Retreat. View the Venus Bay Eco-Retreat location on Google Maps. Travel along Lees Road until you have passed through housing estates 1 and 2 (see locality map to the right). 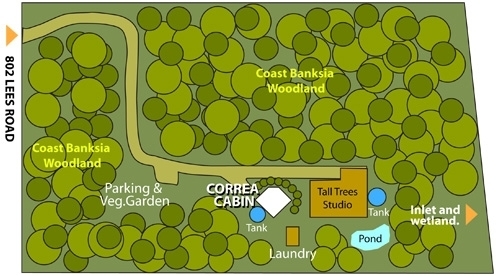 Venus Bay Eco Retreat is at 802 Lees Road on housing estate 3, a conservation zone. Look for number 802 on a post on the right side of the road. Site map. Click to enlarge. Drive slowly along the winding entrance track to the car park and vegetable garden, park your car here and walk along the track to the reception area. If it is wet or dark when you arrive, please drive to the reception area. Phone 0439 352 538 if you need travel assistance.